October, one of my favorite months! The excitement of Halloween, apple pie, Fall festivals, Fall colors, sweater weather, boots and crisp cool evenings. It’s also one of my busiest photography times, for family portraits and beyond. This season I’m privileged to meet some new families and snap their photos in a variety of settings. 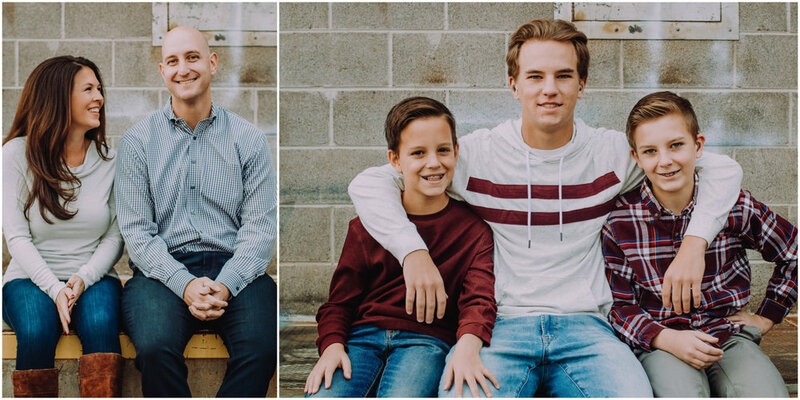 Such a joy to meet this crew, with handsome, polite and photogenic tween & teen boys and a gorgeous set of parents to complete their sweet family. We can capture the essence of Fall, the fashion, the crisp & cozy atmosphere in an urban setting like this one, with gritty, but quaint brick or street textures or we can find a natural trees and changing leaves outdoorsy setting. Whatever we do, wherever we shoot, the focus is capturing your memories. Here are some favorites I snapped at this session.